From Sports Nutrition Supplement Guide Article I wrote which was posted on their site. Grocery stores in the U.S. can be nutritional traps for uneducated shoppers, because processed foods are placed prominently in the center aisles, while nutrient-dense whole foods are pushed to the periphery. It’s a smart marketing ploy, since many shoppers are easily lured by the colorful and appealing packaging which processed foods feature. There’s even a whole science devoted to the psychology behind food labeling! Because of this, I always advise patients and clients to do the majority of their shopping around the perimeter of a grocery store, even in places like Whole Foods, in order to maximize chances of making the healthiest food choices. Think about it. If a food item can be stored in a box, bag or can at room temperature, it means that it probably has preservatives which keep it from spoiling. Start reading ingredient labels and you might be shocked at what you find. If ingredient labels are excessively long or have long names which you can’t pronounce, you probably should steer clear. 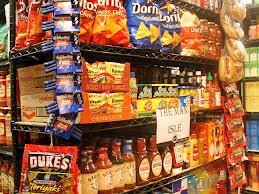 Remember that the least processed foods will be assimilated by your body the most readily. Supermarkets and grocery stores are designed to lure you in like a rat in a maze, but instead of getting a reward at the end of the maze, you might be signing up for health issues if you are distracted by all the colorful advertising found on the most popular food items. Keep in mind that these stores are designed to tempt shoppers to make impulse purchases. Such impulse buys can be especially tempting if you are ravenous with hunger when you shop. Here are some guidelines which will help you to make healthy food choices when perusing a grocery store. 1. Shop around the perimeter of the store – Most processed foods are found in the aisles of a grocery store, while whole foods like fresh produce and meats are found around the perimeter. 2. Read food labels – Be aware of hidden sugar, sodium, artificial flavors and colors, and preservatives. 3. Keep purchases of packaged foods to a minimum – Beware of foods which are packaged in boxes, bags, or cans, as these foods tend to be filled with preservatives. 4. Prepare a shopping list and stick to it – Making a list will ensure that you do not forget any necessary items and will also help prevent impulse purchases if you adhere strictly to the items which are on your list. 5. Eat a meal before you shop – If you shop for groceries when you are satiated, you will be less likely to make impulsive purchases or buy more than what you need. 6. Fill your cart with fruits, vegetables, whole grains, lean meat, fish, poultry, nuts and beans. 7. Try a new fruit or vegetable each week – This will add variety to your meal plan. 8. Spend the most time during your shopping trip in the produce section. 9. When choosing whole grain cereals, aim for at least 4 grams of fiber per serving– Make sure the sugar content is minimal. 10. Choose lean cuts of meat – Good beef cuts are round, top sirloin and tenderloin. When buying poultry, purchase the skinless variety. 11. If you can’t purchase fresh fruit, choose frozen fruits and vegetables over the canned variety. 12. Avoid food items that contain more than five ingredients, artificial ingredients, or ingredients you can’t pronounce. 13. Be careful when choosing bread – Many refined breads are dark from added molasses, caramel or other coloring. Look for breads which contain 100% whole wheat or other grain as their first ingredient. Try to avoid enriched wheat flour as it is actually made with processed white flour. Make sure the bread you select has at least 2 grams of fiber per slice. 15. Choose strong-flavor chesses – Sharp cheddar, feta and Parmesan have strong flavors which means you will need to use less to flavor your foods. 16. Purchase Greek yogurt – Greek yogurt is thicker and creamier than other varieties, and the protein content is much higher. My favorite is Fage Total 0-Percent Greek Yogurt. 17. If you must buy frozen entrees, make sure they contain less than 400 calories, 4 grams of saturated fat, and 600 milligrams of sodium, with at least 14 grams of protein and 2 grams of carbohydrate. 18. Add vegetables and/or cooked brown rice or quinoa to your frozen entrée to increase the size and nutrition level of the meal. 19. Add fresh or frozen fruit to cooked oatmeal to provide sweetness without added sugar. 20. Eat oatmeal – Make sure to buy regular oatmeal, not the instant variety. Here’s to happy and healthy shopping!